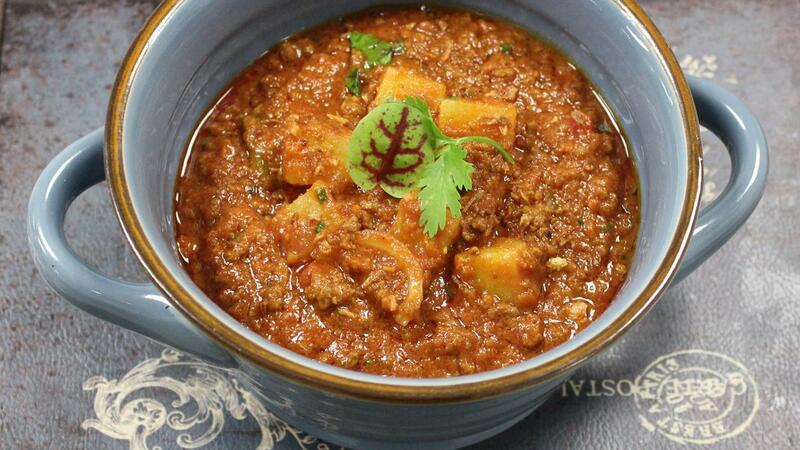 Aloo Qeema also known as Beef mince with potato is a Pakistani dish from the east spicy in taste. We have given this dish its own flare with our marinade spice solutions. A great recipe for everyday of Ramadan. Fry onions with Rafhan Corn Oil in a heavy based pan over medium heat. When onions are soft but not brown, add meat, garlic and ginger and cook over medium heat about 3-5 mins or until all the moisture has dried from the minced meat. Ad spices + 3 tbsp. water and stirring constantly, cook another 2 minutes. Add chopped tomatoes, Knorr Tomato Puree and yogurt and cook for about 10 mins, stirring constantly. Add 1 cup of water, cover and cook 30 mins over low heat or until potatoes are tender. Add garam masala, chillies and coriander right before serving. Aloo Qeema can be served in the bowl or plate. Fresh ginger, green chilli, corianderon the top, serve with naan or rice.